Ford Motor Company has created a unique suit to dramatically teach young people about the dangers of driving under the influence of illegal drugs. Ford developed the suit together with scientists from the Meyer-Hentschel Institute in Germany to simulate some of the effects of drugs, such as cannabis, cocaine, heroin, and MDMA (commonly known as Ecstasy); including slower reaction time, distorted vision, hand tremors and poor coordination. The new Drug Driving Suit will be incorporated into Ford Driving Skills for Life, the award-winning young driver programme that has provided training to more than 500,000 people around the world through hands-on and online tuition since its inception 11 years ago. Young drivers will have the opportunity to wear the suit, and also receive driving tuition on a closed course. "Driving after taking illegal drugs can have potentially fatal consequences for the driver, their passengers, and other road users," said Ford Driving Skills for Life Manager Jim Graham. "We have already seen first-hand the eye-opening effect that our Drink Driving Suit has had on those who wear it behind the wheel, and are confident that our new Drug Driving Suit will have a similar impact." According to a European study, drivers who get behind the wheel after taking drugs are up to 30 times more likely to be involved in a severe crash. Despite the risks, one in 10 people say they have accepted lifts from people they believe have taken illegal drugs. 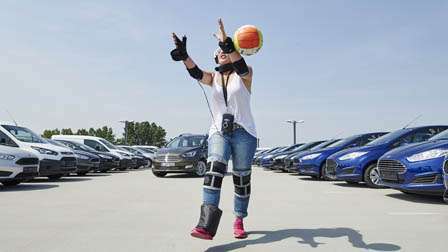 Like the Drink Driving Suit that Ford last year incorporated into the DSFL programme, the new Drug Driving Suit simulates the effects of reduced mobility, vision and coordination with padding and ankle weights, goggles and headphones. The team also introduced new features that simulate affects that are particular to illegal drug use. "We know that some drugs can cause trembling hands, so we incorporated into the suit a device that creates just such a tremor," said Gundolf Meyer-Hentschel, CEO of the Meyer-Hentschel Institute. "Drug users sometimes see flashing lights in their peripheral field, an effect recreated by our goggles, while imaginary sounds are generated by the headphones. Additionally, the goggles distort perception, and produce colourful visual sensations – a side effect of LSD use." The European Monitoring Centre for Drugs and Drug Addiction estimates that in Europe last year 8.8 million 15-24 year-olds used cannabis and 2.3 million people in that age group took cocaine. In the UK, an average of 400 people are arrested every month on drug driving charges, and illegal drug use may be a factor in as many as 200 deaths every year. According to the French Delegation for Road Safety, drugs were a factor in 23 per cent of fatal road accidents there last year and the number of drivers who failed drugs tests rose by 44 per cent. In 2008, Ford extended the DSFL programme to Asia Pacific countries including China, India, Indonesia, the Philippines, South Africa, Taiwan, and Vietnam. In 2013 the first Driving Skills for Life training sessions were held in the Middle East, in the United Arab Emirates, and the programme was formally launched in Europe. Since then, DSFL has in Europe provided more than 9,000 18-24 year-old drivers with free hands-on training focusing on the leading factors in young driver accidents, including hazard recognition, vehicle handling, speed/space management and distractions. The company has teamed with leading safety organisations including the Belgian National Road Safety Association, Association Prévention Routière in France, Deutscher Verkehrssicherheitsrat in Germany, the ACI in Italy, Road Safety Russia in Russia, Dirección General de Tràfico in Spain, and the Royal Society for the Prevention of Accidents and AA Driving School in the UK. The programme, which also is running in Romania, will this year be extended to a total of 11 countries across Europe following further launches in Denmark, the Netherlands and Turkey. Last year, as well as introducing the Drink Driving Suit, Ford also introduced training to specifically highlight the dangers of social media activity at the wheel, such as taking selfies. What factors motivate people to text while driving?